THE digital divide is getting smaller as more and more senior citizens take that first tentative step into the world wide web, to explore, express and learn. Surveys have revealed that senior citizens aged 65 and above make up the fastest growing age group online, but as the number of users grows, the amount of content to cater for them remains a step or two behind. This is where people such as Lily Fu, a 60-year-old grandmother of four, come in. She launched her blog, SeniorsAloud (seniorsaloud.blogspot.com) in May with one goal in mind. "I wanted to provide senior citizens with an avenue to network online and share their life experiences. We believe in active ageing, and in living our golden years with passion and purpose," writes the part-time university tutor and English Language trainer. With a host of guest bloggers, topics relevant to the elderly are frenetically discussed to give the senior citizens a voice on the web. I was first introduced to the Internet in 1994 when I was visiting my daughter in Canada. One night, I saw her emailing and chatting with her university friends online. I was amazed. What a great way to keep in touch – so much faster than by conventional mail, and far cheaper than paying for long distance calls. Soon after, I bought my first desktop. As a high school teacher then, I was interested in using the Internet to supplement my English classes. I started a chat-room on IRC for my students in 1996. I believe we were among the early schools with an online presence. I’m quite proud of that. When I first read about blogging in 1999, I was keen on starting a blog for those over 50 years of age, being in that age group myself. I wrote to a newspaper about it, hoping to get positive feedback. My letter was published but there was no response at all! I guess most seniors in those days were not internet-savvy yet. Now, almost 10 years on, I believe the time is right to start a blog for seniors. In 2007, a friend, Samuel Goh (motivationinmotion.blogspot.com), who was already a blogger, invited me to an Internet marketing seminar. I started a blog in order to apply what I had learned. SeniorsAloud is my second blog and the first article was posted on May 10, 2008, just three months ago. So it’s quite new, but the response this time around is much more encouraging. As the word gets out, I’m sure the blog will receive even more visitors. It’s a known fact that many countries, including Malaysia, are seeing an ageing population. The average life span has increased. For males and females, it’s 73 and 76 respectively. In 2007, according to statistics from the National Population and Family Development Board (LPPKN), the elderly, or those who have touched 60, make up seven per cent of the population. There are issues concerning the elderly that need to be addressed, like health care, financial management, and housing. There are also more seniors now with access to the internet and thus a blog would be a great avenue to reach out to these seniors, while also encouraging those who are apprehensive about the internet to take the first baby steps into this whole new realm. It literally opens up a new world, and even those seniors who are homebound can still have an active social and intellectual life via the internet. On a personal level, I know of retirees who have difficulty adjusting to a life without a 9-5 job. They feel a tremendous loss of self-esteem. Some have lost their spouse and feel lonely and depressed. SeniorsAloud is intended to be a community-based blog where seniors and retirees can network and share their rich life experiences. It is also a channel for them to speak out on issues that affect them, whether it is the lack of elderly-friendly public facilities, or the discrimination leveled at them. It takes a senior to understand another senior and provide moral support for one another. What have you achieved through blogging? The blog is only three months old, so it’s still too early to talk about achievements. But to date, the feedback has been very encouraging. "Inspiring" is the word visitors often used after reading the posts. One visitor in her 30s wrote in an email that the post about "Grandparenting – A Pleasure or Pressure?" helped her to better understand her parents. I’ve always wanted to give something back to society. SeniorsAloud is the perfect vehicle for me to accomplish this. I can blog at home and still keep an eye on my grandchildren and my elderly mother. And the best thing is that it’s free! So there’s absolutely nothing to regret. Of course, blogging can be quite time-consuming, but I enjoy the challenge of keeping the blog current. I now carry my camera everywhere I go. I’ve learned to be bold in approaching people and telling them about my blog. You can say blogging has given me new confidence and a new direction in life. Through it, I’ve been fortunate to connect with many seniors who have been most supportive in contributing to the blog content. The "Blogosphere". What does it mean to you? The Blogosphere adds a whole new dimension to information gathering – almost anything and everything under the sun probably has been the subject of a blog. That said, one of the challenges of the internet, including blogs, is to sift through all the information out there – sometimes there is an information overload. Nonetheless, it’s always better to have too many options than none at all! I’ve got several bookmarked under "Favourites", so I won’t commit to singling out any particular one. It’d be like asking me who is my absolute favourite among all my grandchildren. I love them all. If there were someone you could influence to blog. who would they be? Definitely all those above 50! This is the fastest growing age group on the Internet, but certainly not in Malaysia. I still meet a lot of seniors who say they are too old to pick up computer skills, or they are simply not interested. 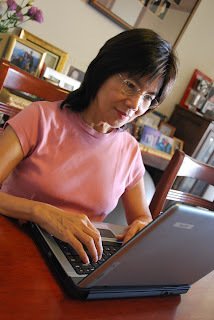 Blogging is fun, mentally stimulating and who knows, it may help ward off Alzheimer’s! When I’m in my 80s or 90s, provided I don’t have arthritis in my fingers, I intend to carry on blogging. I’ll take blogging anytime over knitting in a rocking chair! Hello. My name is Patrick Teoh and I am 61 years old and I am a blogger. Please allow me to congratulate you on this wonderful blog that you have created for seniors. I enjoy reading it. I am not altogether sure how I got here though. Some things the years just don't spare I suppose. Hi, Patrick, Thank you for visiting my blog and leaving a comment. The world is much smaller than it already is, for I visited your 'infamous' blog some time ago, and I am not sure how I got there :-) You've got such an absolutely wicked sense of humour & wit. Makes reading your posts such a delightful experience.